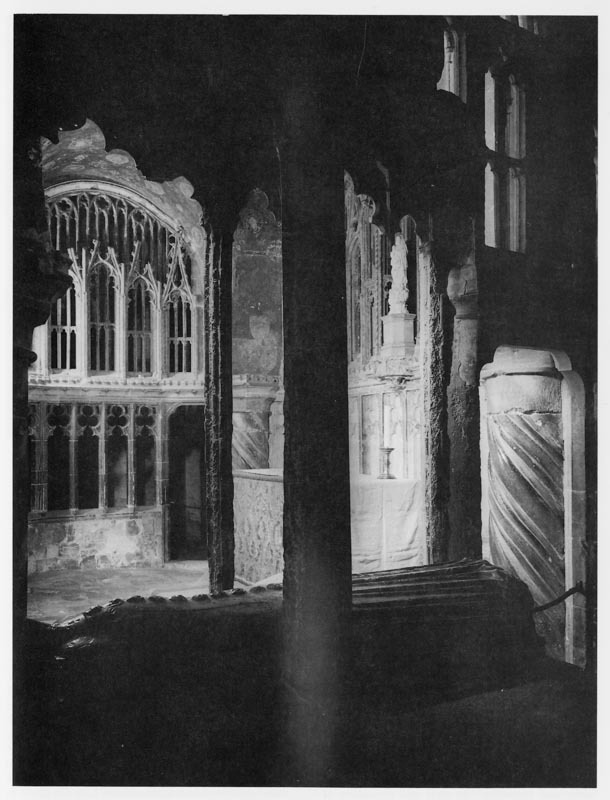 Chapel of Our Lady Undercroft, Canterbury, by Edwin Smith. His last photograph made on a specific assignment. I work quickly, discreetly and always in the lighting conditions that exist at the moment, the camera, with a focusing screen that necessitates the use of a black cloth over the head, always on a tripod, and with exposures that vary in duration from about ten seconds to as many minutes. With luck it will still be early enough for the cathedral to be relatively deserted and I try to get through with general views while there is still no more than an occasional visitor to avoid. Long exposures have the advantage that they can be divided, the lens being covered while anyone saunters across its path, and I have sometimes divided a minute’s exposure into as many as thirty separate units as absorbed visitors pass in and out of sight behind piers and monuments. My favourite visitors sit in bemused tranquility, showing no movement during an exposure of several minutes, or are dressed darkly and move briskly which means they leave no trace. Very wearing are pairs of ladies in white who take ten minutes to stroll down a 200 foot aisle engaged in eager conversation, or become engrossed in the irrelevant details of a modern monument half-way down. The visitor population of cathedrals varies seasonally and geographically. Always less in winter and always less in the north and east than in the south and west. Ely Cathedral on a midwinter afternoon with no more than a single local fugitive from the freezing fenland huddled round one of its giant stoves is desolate and heart-piercing. Canterbury any time between early spring and late autumn can be as busy as the concourse of a railway terminal and as bitterly bewildering. 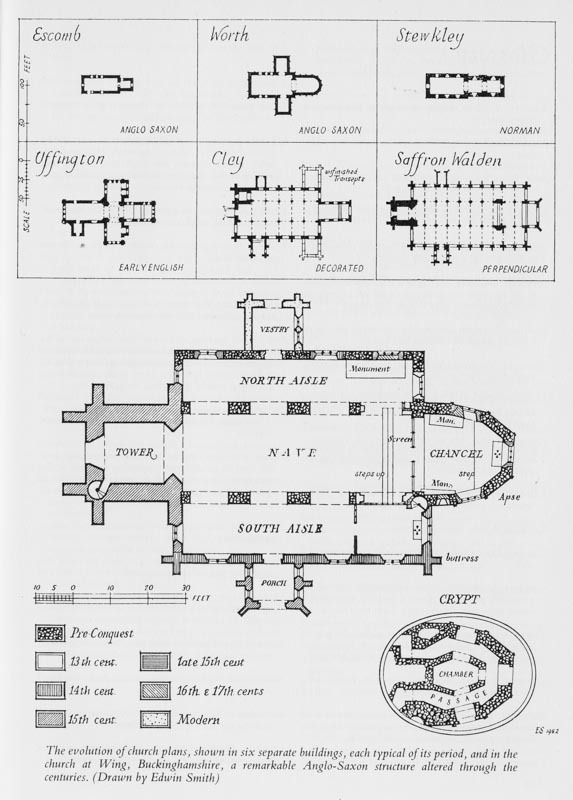 Edwin’s architectural exposition of the evolution of the English church. The great cathedral is a public experience. Not with the greatest good fortune could one hope to enjoy it quite alone, nor perhaps would it be comfortable to do so. But the parish church, outside the hours of conventional worship, is for private experience and it is the rarest misfortune to share it with anyone less effacing, less part of the ambience, than the practising organist, the altar ﬂower arranger or a very occasional incumbent. For me, photography in a good village church is unalloyed bliss. A cathedral is a great machine, impressive and mysterious, and one can rarely visit it without making a special effort. However tranquilly isolated in its own close it eventually proves to be, one has to brave the traffic of its town, the confusion of its streets and the mundane irritations of its parking arrangements. 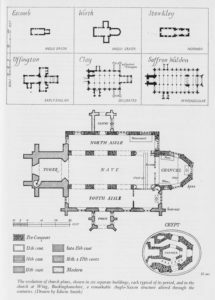 But it is possible to come upon the perfect village church quite by chance, breaking a journey on impulse, entering without premeditation to receive some of the most exquisite pleasure that building can offer. The visual pleasures and surprises of visiting country churches have been among the most vivid and poignant of my life, and it is a perpetual source of wonder and gratitude to me that it is possible to walk casually into these marvellously articulated structures, to be surprised, delighted, diverted, amused and deeply moved without being disturbed by the presence of a single other person. At all hours of the day, long after I was expected elsewhere or have found a hotel for the night, I have hurried back to the car for my equipment and begun working — entranced by the sense of communion with something admired to intensity, intoxicated by the privilege of being able to pay it the homage of my craft. I must confess that I seldom risk breaking this spell by actually asking permission, for speech dilutes vision; and I offer apologies to the incumbents of many churches for this discourtesy.